Daily Illuminator: Play Munchkin Like A Pirate Game Day Locations! September 11, 2017: Play Munchkin Like A Pirate Game Day Locations! Ahoy, mateys! It's time to make your enemies walk the plank – during a #PlayMunchkin Like A Pirate Game Day at a friendly local game store near you! Each event will feature demos or games of Munchkin Booty Guest Artist Edition, plus plenty of promo cards and bookmarks with special Munchkin rules on them. In this game, players are both munchkins and pirates! Wield weapons like the Cutlass, commandeer Galleons, and defeat the Lobster Mobster or your pirate rivals, Redbeard, Blackbeard, and Nobeard. These events are mostly between September 15 and 22, but call your game store ahead of time to find out exactly when they're holding theirs. 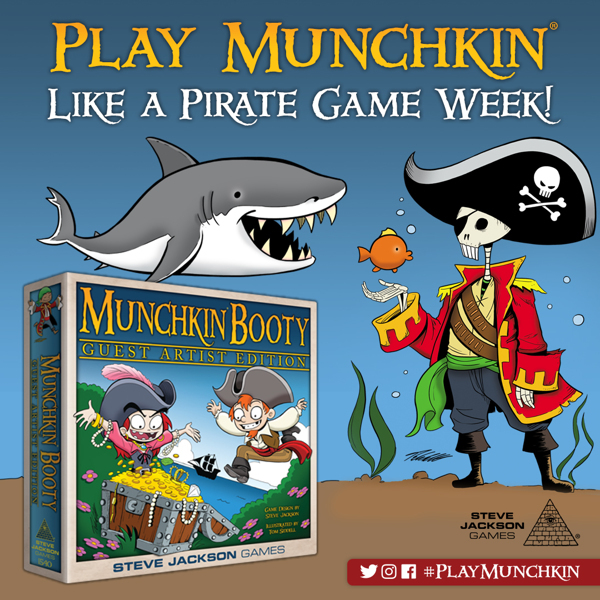 If you attend an event during that week, you can enter yourself to win prizes if you post a picture of Munchkin Booty Guest Artist Edition being played, with the hashtag #PlayMunchkin! Here be all the swashbuckling locations!